"Autumn" began in 1993 in Ekaterinburg (Russia). The idea of the making the group belonged to Yury ,"Rottor“( former guitar of "Russian Winter" and participant of the first composition of the group "Thy Repentance") and Sergey Berdyshev - a drummer, familiar to Rottor also on joint participation in school and student groups. For that moment Sergey co-operated with group "Aleteya", which experimented in the field of Death Metal at the beginning. Exactly in this group was found the second guitar - Sergey, "Raven". All three has united the interest to new, therefor time, music - Doom, the general gravity to melancholy and negation to every sort and kind of put and hastes. The Group began to rehearse. A little later to group joined Svetlana Polezhaeva, "Slavyana"(keyboards and vocal). Then, when the group changed several bass-guitars, who hadn’t got along, "Autumnal People" recalled about Felix Vigorov who played with them in a school group. So was formed the first composition of "Autumn". In 1995 in one of the small rehersal studio group recorded its first demo "The Druid Autumn", consisting of three compositions in English. Spreading demo concerned with "Undead Wood Records" and it got some good reviews in several underground printed matters. In 1997 in "Pinoccio Records" studio “Autumn” recorded the first full-weight 60-minute demo-album "...And We Are Falling Leaves". All texts, as before, in English. After albums release in group occurred great staff reorganisation. Updated group prepared and released in 2000 the second album - "Chjornye kryl´ya" ("Black Wings"), recorded, either as earlier on "Pinoccio Records"studio. This time all lyrics, except one, on native - Russian language, which in its turn is connected with desire more liberally and deeply express their own thoughts. From this moment "Autumn" definitively moves to native language. The Album was published in small edition and quickly spreaded through local music shops and sending out. According to tradittion, after albums release occurered some changes in staff. It changed guitar,keyboards player leaved the group , but appeared the new instrument - viola and viola player -Lydmila Emeliyashina, whose receipts powerfully changed and enriched the sound of the group. 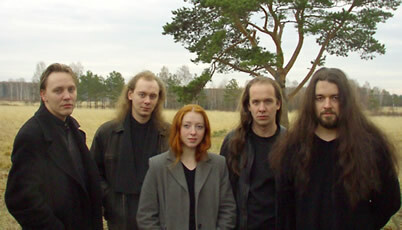 At the beginning of 2003 the group finished its last album recording - " Osen Vechna…"(“Autumn is eternal….”). Because of musician’s dissatifaction by previous album sound, the record is made in two different ways as an experiment. Recording drums, information and mastering are done in local recording studio "AV - misic", but the whole rest work on recording the album is executed in home condition. The result of the experiment turns out to be on surprise positive. The sound of the album got much more close to desired, than earlier. Besides, the group found a publisher - "Stygian Crypt productions". In June it is expected that AUTUMN "Osen vechna…" album is edited in 1000 copies.